Discussion in 'Blades' started by Different Drummer, Apr 7, 2019. OK guys and Gals, help me out. I need to locate a blade smith or anyone that has the ability to make a couple of working knives. Not looking for custom pretty display pieces but rugged to be used and probably abused working knives. I want to gift these to two of my closest Newfoundland friends. The knives will be "Splitting" knives also at times called "sound bone" knives. Photos will follow. This all started out as a show of appreciation to one friend who lets me use his lobster boat while I am in NL. When his brother got wind of my plan he expressed a desire for one as well. So now I need two. To see the knife in action one can just google "splitting and drying cod fish". The only splitting knife available to buy is a made in China POS that they break with frequency. I have an old one that has seen many trips to Labrador aboard the schooners that spent the summer and Fall fishing before returning to Newfoundland with holds packed with salted Cod. I can make this knife available to a knife maker to use as a guide. The older knife was made in Sheffield England. The newer one with the smaller handle is the Chinese version. The knifes I need built should have the larger handle like the old timer and be made of a steel that will take the forces placed upon it when splitting fish without fracturing or breaking off. Additionally because my Newfie friends are not known to fuss over their equipment and being used around salt water a metal that can survive the environment and lack of attention is desirable. Soooooo, how about some suggestions for a no nonsense knife maker that will not break my bank. It would be nice if I could keep it relatively local to NY as well. Edit: The blade on the old knife is mis shaped due to much use and sharpening. The Chinese knife is new and has a proper shaped blade. Sounds like a very generous and thoughtful gift. I couldn’t recommend a specific Smith but I’m sure you could run one down with a google search and a few phone calls. I will start searching but I know I see folks on the forum discussing knives and knife making from time to time so I figured I would ask here as well. Other thing is I am looking for a rugged functional knife that was not made to be a piece of art with the accompanying price tag. Its a start, good luck! No, that won't cut it. (Pun intended) I guess you need to see one in the hands of a good splitter to understand how it is used. The long large diameter round handle is much preferred. One of the complaints about the Chinese one in addition to it breaking is the short handle. There is a slight curve to the blade as well. In fact they come in Right and in left hand. The cutting edge of the blade is pretty flat or square. I am thinking of going to Southhampton for a visit and see if they would sell me the steel blanks. Then I could get someone to put a nice beefy hard wood handle on them. Thanks for the link. I will see if I can find anyone listed that might help me out. 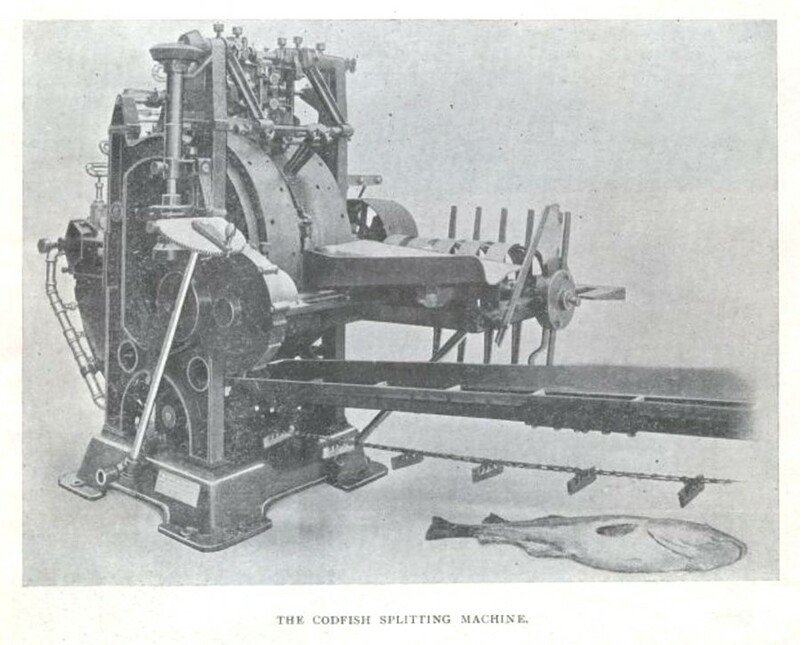 This shows splitting cod for drying. The table is a splitting table. Note the block of wood fastened to the table to place the fish against. This helps hold it in place as it takes some pressure on the knife to remove the sound bone. Usually there are three men working a table. One guts the fish, then the "header" removes the head at a beveled edge on the table. ( header not seen in this video ) and the splitter gets the fish last with no head. Splitter removes the sound bone with three cuts. One down either side of the sound bone and then one final cut passing underneath and removing it. Good view of the knife in the video. In the days of the schooners it is said that an experienced splitter would have a sound bone in the air constantly. Splitting the fish opens it up ( butterfly ) so it can be laid flat for salting and later laid upon the drying flakes. This video shows one guy leisurely splitting a small number of fish. The guy's I want the knives for might split a couple thousand pounds of fish at a session. So the knives get a good workout. I usually head, and cut tongues and cheeks. While working at the table I have seen them break four or five of the Chinese made knives. They guy in the video is actually pretty slow and awkward. It would take him three days to do a 1,000 pounds. What are you messing around with some knives when you can have one of these? 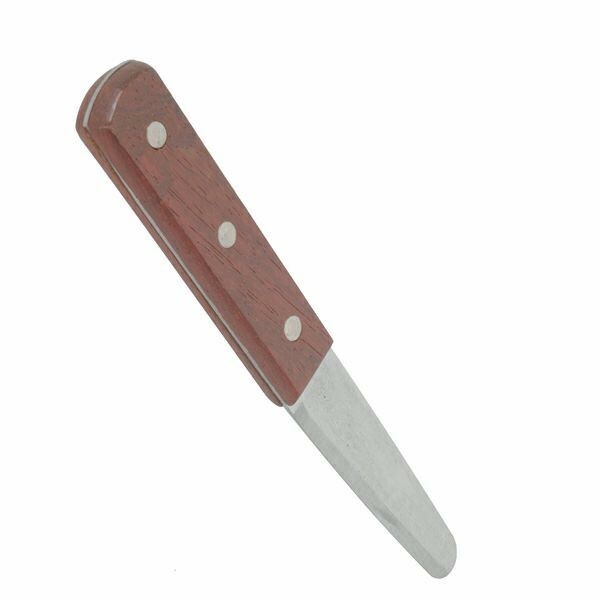 Your best bet is to find somebody who specializes in metal reduction knife making. It will he much easier to match your blade dimension requirements. Yes, forgers would also be able to make the blades to the dimension but it would cost a lot more for that type of blade. There used to be a lot of good metal reduction blade makers on a couple of the more popular knife sites. I’m not sure who may still be around, I haven’t been on them in quite awhile. yeah the fish plant down the road has several automated splitters. More modern than what you picture though. There are two markets in NL for salt fish. A large portion of the fish goes to the fish processor who splits the fish and puts it in a salt brine. It is then shipped to Europe. Predominantly Portugal and perhaps Spain where it is then dried. The local fisher people have a local market of their own. This market consists of people who purchase their "winter fish". The tradition of dried fish remains strong in NL. This fish is all processed by hand on the Wharf by three to four of the fisher people just as it has been done since the days of sail and dories. It is split and laid in crab pans placing salt between the layers of fish just as it used to be placed in the holds of the schooners. After a few days it is taken out to dry on rope or wire flakes. Best drying is a windy, cloudy Fall day. Contrary to the belief of some not familiar with the process, direct or hot sun is not a good thing. If the drying conditions are good it will take about four days of drying. Constant attention is required to keep the flies away from the fish. This fish is the fish that the locals buy for their "winter fish"
I built a 6X4 drying box with fly screen and a hinged lid to dry our fish. It is large enough to do what the little lady wants. Rest of her cod comes home as frozen fillets. This is all fish that we handline ourselves during the recreational or food fishery. The food fishery lasts a total of about 35 days spread out from July to November. The purpose is to allow people to continue the tradition of putting up fish for their personal consumption during the upcoming year. Agreed, something made from and old automobile spring or maybe one made from a file ground to shape seems like it would fit the bill. I’d call up James at Indy hammered knives. He’s pretty flexible and makes a good quality product at a fair price. If you are going to the expense of having one custom ground, I'd start with a higher quality steel to begin with. You mentioned corrosion resistance as a desirable trait, and that won't be found in springs and files (much as it is cool to make things that way). Good point made. Adding to the need for corrosion resistance is the fact that my Newfie friends are not very good about maintaining their equipment. To say they are hard on their stuff is an understatement. Thank you for the very good suggestion. I googled and watched a few of his videos. His philosophy in life and mine are similar in many ways. The only thing that may throw the wrench in the gears is cost. I am going to give him a call and try to get a feel for what the expense might be. Remember, these knives will be on the wharf working hard. They could potentially be lost overboard and certainly will be subjected to ravages of hard use. Thus I am reluctant to invest in knives that are "pretty" collector pieces. Just tell him what your looking for. He’s very accommodating. I wanted some throwing knives and bought 4. They come in individual sheaths. I contacted him and said can you make me a sheath that would hold all 4. He did and said I’ll hive you the sheaths they come with. I said there’s no need so what would be the added cost since I likely won’t use them. He said no cost. I think his knives only cost what they do because the wood and nice leather sheaths with rings. If you don’t need the nice wood or fancy sheath he can likely make it cheaper. Called and the voice mail system took over. I can understand that as he has a shop to run. Trouble is the voice mail was full and would not accept any more messages. I have seen that video. I believe she is at some sort of heritage center and the folks are tourists learning about the traditional cod fishery. There are couple of good views of the splitting knife in the video. I wish you could see an experienced person splitting. They are very smooth and fast. All cuts are made with one smooth continuous stroke. Same with their filleting techniques. I watch my neighbor fillet about 400 fish in one session. I was skinning the fillets and was struggling to keep up with the fillets he ws throwing to my end of the table. Of course the split cod for salting and drying are not filleted or skinned. One exception I found with the video was her comment about drying on a "sunny" day. Sun is OK if not too intense but the wind is much more important. A dry cloudy but warm day with a stiff breeze is perfect. They call it " Making Fish". Who knows how many tons this old timer has made. Cod heads are a delicacy to the Newfoundlander's . They have to be cut a special way. In the beginning of the video he is heading a cod and then preparing the head. Later in the video you can see the crab pan that the fish are salted in and at the very end a small flake that the fish are dried on. Perhaps next year I will make some posts of cod fishing, preparing and drying cod. A little Newfie music for you in this one. Lyrics are typical of the Newfie life style. Can someone explain to me why Micro Roni is legal in NY?